The correct advance deposit must accompany the original petition; otherwise, the pleadings will be returned to sender or filed only and held until the filing fee is received, if prescription is a factor. When all of the advance deposit is depleted, no documents or pleadings will be filed and no action will be taken by the Clerk until an additional deposit is made or costs due are paid. All outstanding court costs must be paid before a suit is dismissed. Please call the Suit Department at (225) 473-9866, ext. 296 for costs through dismissal. To receive certified copies of judgments, all outstanding court costs must be paid. Fax filing transmission fee is $5.00 plus receipt fee of $15.00. In addition, fax pleadings filed in record will be charged $6.00 for the first page and $4.00 each additional page. Original pleadings must be received and filed within 7 days. Regular charges will apply for filing original documents. NOTICE: Pursuant to Act 415 of the 2017 Regular Session which enacted R.S. 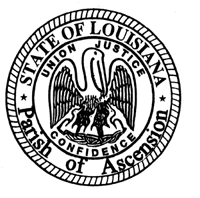 13:996.69 relative to a courthouse building fund in Ascension Parish, the following costs are effective DECEMBER 1, 2017: (a) A filing charge of $150.00 per initial filing in a civil suit (excluding adoptions); (b) A filing charge of $30.00 upon the filing of each additional pleading in a civil matter.